Avenue Q is an American musical in two acts, conceived by Robert Lopez and Jeff Marx, who together, wrote the music and lyrics. The book was written by Jeff Whitty and the show was directed by Jason Moore. Avenue Q is an "autobiographical and biographical" coming-of-age parable, addressing and satirizing the issues and anxieties associated with entering adulthood. Its characters lament that as children, they were assured by their parents, and by children's television programs such as PBS's Sesame Street, that they were "special" and "could do anything"; but as adults, they have discovered to their surprise and dismay that in the real world their options are limited, and they are no more "special" than anyone else. The musical is notable for the use of puppets, animated by unconcealed puppeteers, alongside human actors. 2004 Tonyae Award winner for Best Musical, Best Original Score and Best Book of a Musical! Playbill.com describes Avenue Q, a decidedly adult puppet/human show, as a meeting of Sesame Street and South Park. Our deluxe songbook features all 20 songs in standard piano/vocal format (melody in the piano part), more than 20 fabulous full-color photos from the production, and a bio of the writing team of Robert Lopez and Jeff Marx, who've scored big with their first Broadway show! From the Tony award-winning musical Avenue Q, this sweet and whimsical song takes an ironic look at love and friendship through somewhat skeptical eyes. 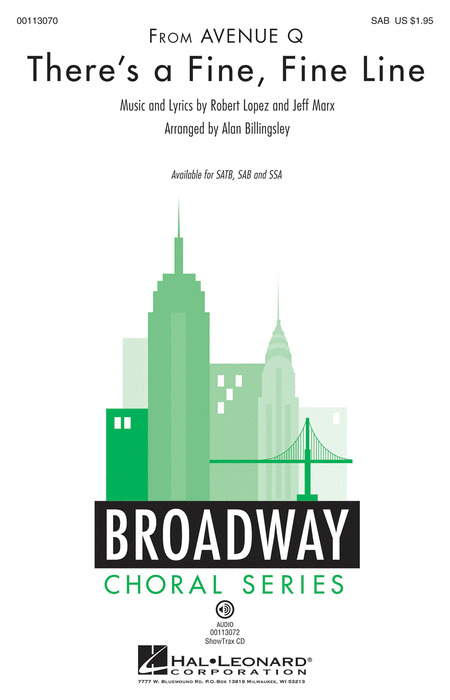 An excellent contemporary change of pace for a Broadway concert set, it's perfect for featuring one or more soloists.